Installing the App Inventor Setup software package. This step is the same for all Android devices, and the same for Windows XP, Vista, Windows 7, 8.1, and 10. If you choose to use the USB cable to connect to a device, then you'll need to install Windows drivers for your Android phone. NOTE: App Inventor 2 does not work with Internet Explorer. For Windows users, we recommend using either Chrome or Firefox as your browser for use with App Inventor. You must perform the installation from an account that has administrator privileges. Installing via a non-administrator account is currently not supported. 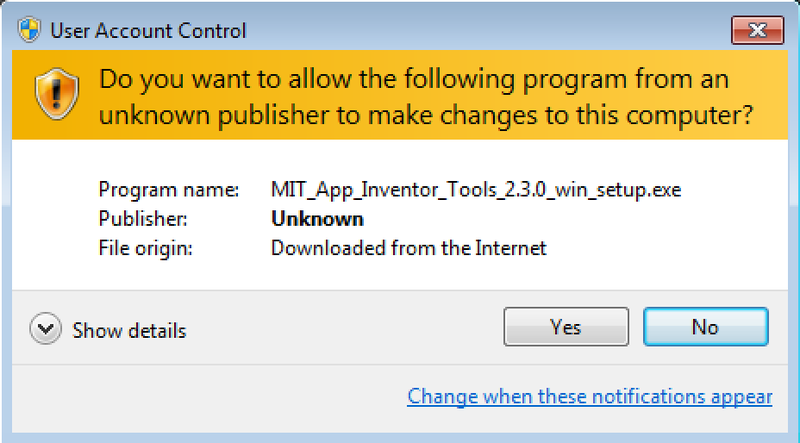 If you have installed a previous version of the App Inventor 2 setup tools, you will need to uninstall them before installing the latest version. Follow the instructions at How to Update the App Inventor Setup Software. Locate the file MIT_Appinventor_Tools_2.3.0 (~80 MB) in your Downloads file or your Desktop. The location of the download on your computer depends on how your browser is configured. Click through the steps of the installer. Do not change the installation location but record the installation directory, because you might need it to check drivers later. The directory will differ depending on your version of Windows and whether or not you are logged in as an administrator. In most cases, App Inventor should be able to locate the Setup software on its own. But if it asks for the location of the software, the path to enter is C:\Program Files\Appinventor\commands-for-Appinventor. If you are using a 64-bit machine ((How to tell if you're on 64-bit Windows), you should type Program Files (x86) rather than Program Files. Also, if you did not install the software as an administrator, it was installed in your local directory rather than in C:\Program Files. You'll need to search for it to find the correct pathname.